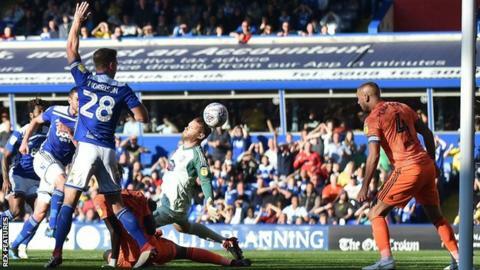 Lukas Jutkiewicz scored twice as Birmingham City came from 2-0 down to deny struggling Ipswich Town a first league win of the season. Ipswich set about their opponents in the opening period, as Jon Nolan curled into the top corner to put them in front, and Everton loanee Matthew Pennington swept a shot into the corner to further stun the home side. Birmingham, who beat leaders Leeds last week, responded when Jota played in Jutkiewicz, who slipped his shot into the back of the net to pull one back. The Blues striker, having just struck the bar, then hit his second of the game into the roof of the net from close range to level. Pennington was then dismissed with four minutes to play for a second yellow card, having brought down Jacques Maghoma in midfield. Town keeper Dean Gerken still needed to be at his best late on to deny Blues all three points, saving at point-blank range from Che Adams. Garry Monk's Blues only ended their own wait for a victory last weekend, stunning Marcelo Bielsa's highfliers Leeds, and needed their second-half response to claim a share of the spoils here. Ipswich's 12-game run without a victory stretches back to the end of last season, but this was their best opportunity to end it after taking the lead for only the third time this season. Despite being unable to keep Blues at bay, Millwall's defeat by Sheffield United saw Paul Hurst's side leapfrog the Lions into 22nd place. Meanwhile, Ipswich are set to be without striker Ellis Harrison for at least two months because of an ankle injury. "Being 2-0 down at half-time and not going to plan, to get that response is crucial. To get those two goals back and have chances to win it in 45 minutes, I'm very happy with that fantastic character and belief. "The two goals we gave away were poor. It was very odd to see those two mistakes. They lead to two goals and you can't afford to do that. "We look at it as two points dropped. The way that we responded and the other chances we had after that, they could have easily been goals." "You're certainly hopeful of getting the victory when you're 2-0 up. "We knew there would be pressure in the second half, but then they go and score pretty much from the restart with the first attack they have. "That got the crowd back involved and gave their players a lift. "A lot of feelings and incident in this game but, in the end, it's a first point away from home and we move a place up in the league."